The transition from fossil fuels to the gasoline you put in your car involves a lot of refining work, and this includes the addition of several additives. “Traditional” additives, such as methanol, benzene, and MTBE have been successfully used to achieve a boost in octane rating, for example, but come with detrimental effects to human health, engine health, and the environment. For these reasons, there’s been a push for new, “non-traditional” gasoline additives (NTGAs) that can give us the fuel properties we need without the harmful side-effects, while also being renewable. Aside from these beneficial additives, it’s possible that new, harmful additives could be found in gasoline. For example, the Asian Clean Fuels Association identified a list of cheap octane-boosting compounds found in some Asian gasoline that may introduce their own negative effects, such as gum formation in the engine. With these new additives surfacing, both beneficial and harmful, proper analytical techniques are needed for future gasoline monitoring. For NTGA analysis, we propose that the conditions of ASTM D8071 be used over Detailed Hydrocarbon Analysis (DHA) via ASTM D6730. One of VUV’s key advantages in the world of NTGA analysis is its adaptability to new compounds, unlike DHA. Like other detectors, VUV gives you a linear response over a wide concentration range, as shown in Figure 1. However, unlike the GC-FID analysis of ASTM D6730, which identifies compounds using retention time only, GC-VUV identifies compounds using both retention time and spectral matching. Additionally, VUV can deconvolve coeluting compounds, as shown in Figure 2. These factors allow you to easily analyze and quantify new compounds; all you need is a reference standard, and once you have the compound’s spectrum and information in your library, you can tackle these new compounds with ease! Figure 1. 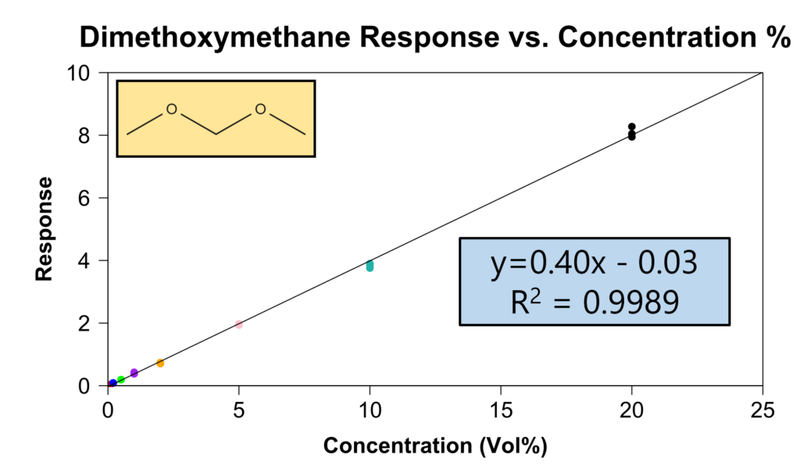 Plot of concentration versus response for the NTGA, dimethoxymethane, in gasoline. Even over a range of 20% to 0.05%, the measurements are very linear. Figure 2. 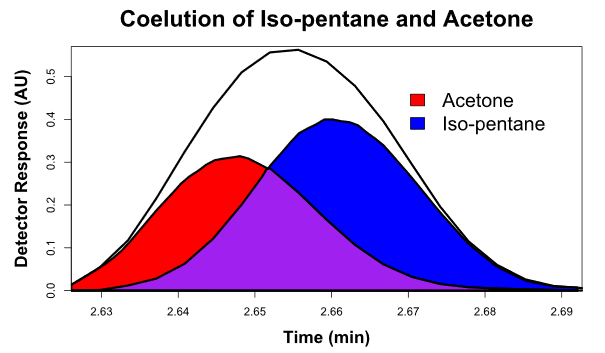 Acetone, one of the NTGAs analyzed in this experiment, coeluted with iso-pentane. With DHA, this coelution could have proven problematic for proper identification and quantification, but for GC-VUV, they are easily distinguished through spectral deconvolution.